Having sporadically joined in with #MySundayPhoto over the years it just seemed right to join in with the last one ever. 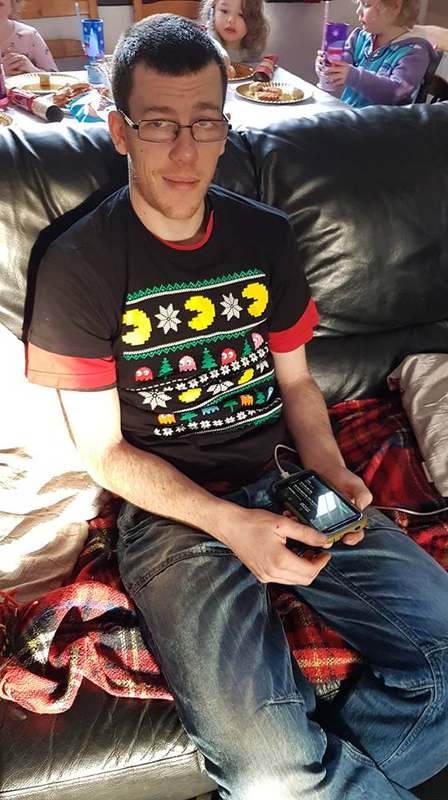 A huge thanks to Darren for running it and good luck to him with the next stage of his blogging career. This week again we are going right back to the title of my blog. 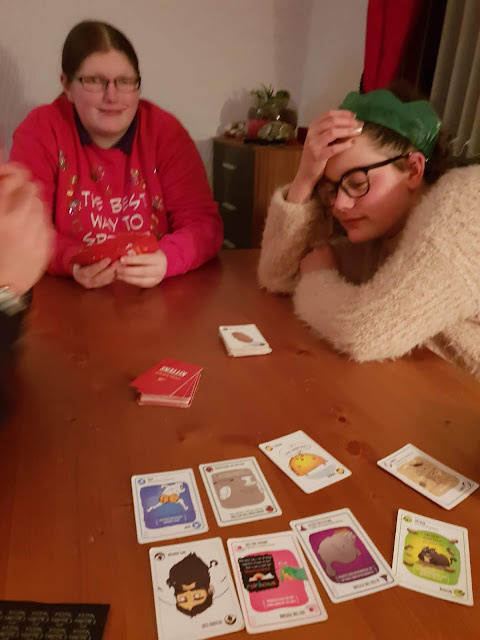 This was one of the pictures taken on our traditional second Christmas, where the grandchildren come to us and they get presents from our side of the family. They all look forward to this as much as I do. It means we get to see them open the presents and play with the items we bought. Fifi ( 16) got a wrapped suitcase from Auntie H and Uncle M as part of her Christmas, and inside the case was the presents for them all. 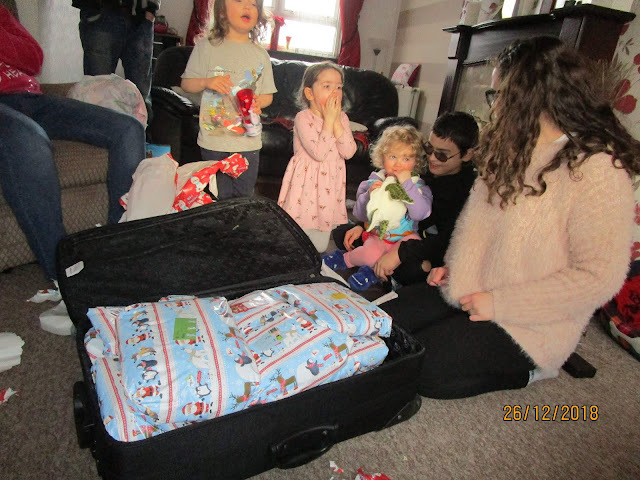 This is the moment of opening to case to see the presents and all the children made happy gasping noises when they saw what was inside. Happy New Year and all the best for 2019 to all my readers. Another full day at work. Forgot to take my glasses so did not manage any sewing but did some colouring instead. The moon was stunning tonight. Driving home I wish it would have turned off it's full beam it was very bright. Time I got to the village it was seriously foggy and the moon looked stunning with circles of many colours round it. Phone camera would not do it justice so never bothered taking pictures. 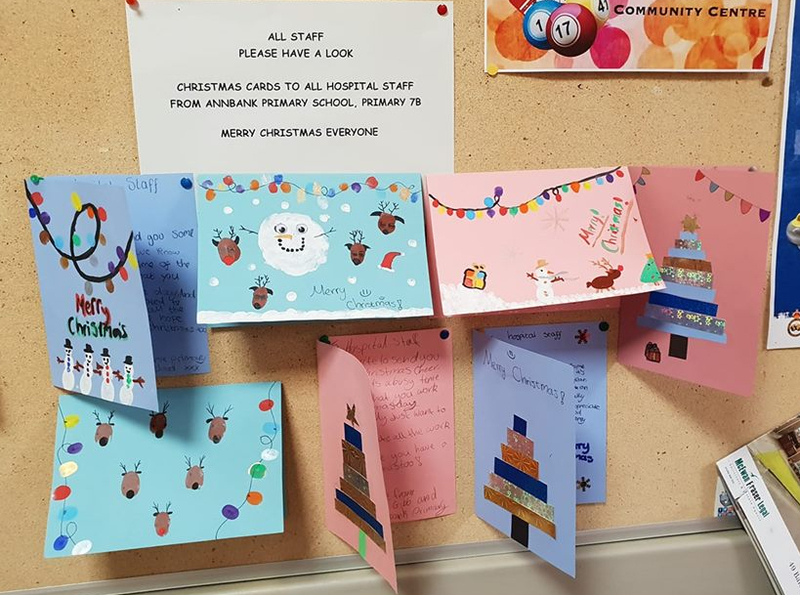 I did spot these on the hospital notice board and loved the thought that had been out into them. 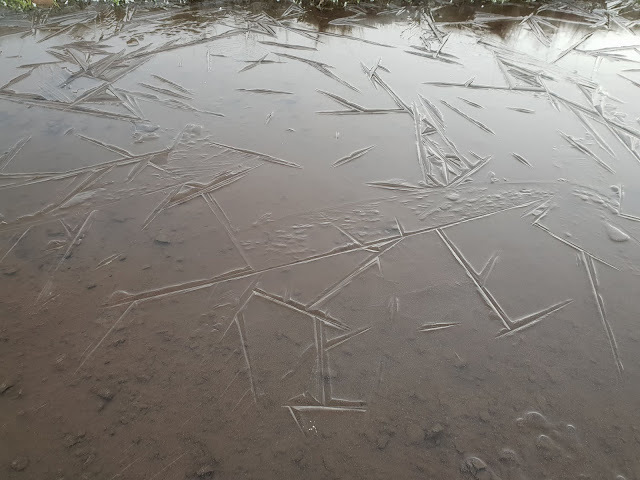 A freezing day. Had to send my auto defroster out for the car. It did not thaw off where the sun had not shone. Sharing this rather than another boring fishery reflection picture. 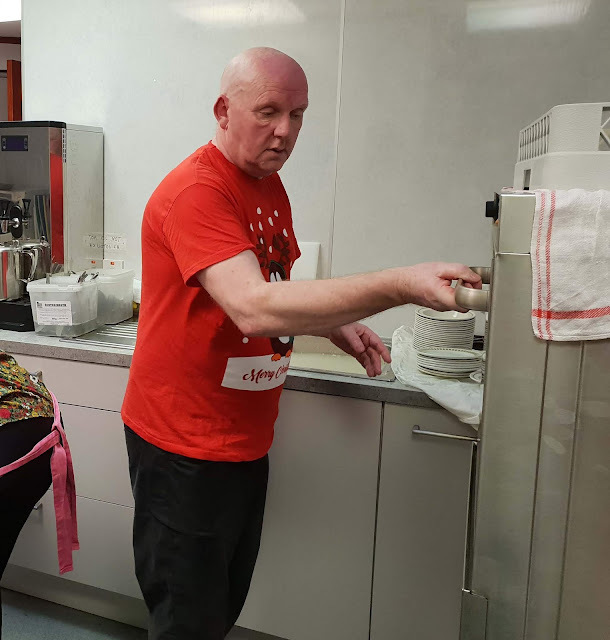 Christmas Day, again we have decided to volunteer our time and I helped to serve food while hubby spent the whole time up to his elbows in dirty dish water. By some sheer million to one coincidence as we parked up at the venue there was a taxi dropping off clients for the event. The taxi driver came across and spoke to us,he had traded in the car we are now driving. He thinks he may have roof bars for it and is going to phone us if he finds them. I bought this top yesterday. I wanted something that was nice but screamed CHRISTMAS in your face when you saw it.Think I succeeded in finding just that.I got a lot of compliments on it. 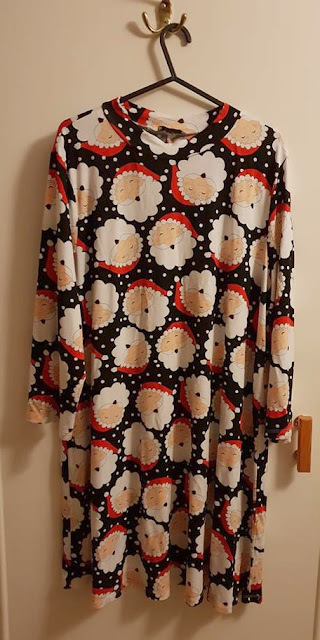 It is now washed and ready to go into the loft with the other Christmas jumpers, t-shirts etc until next year. Today we did Christmas in our house. 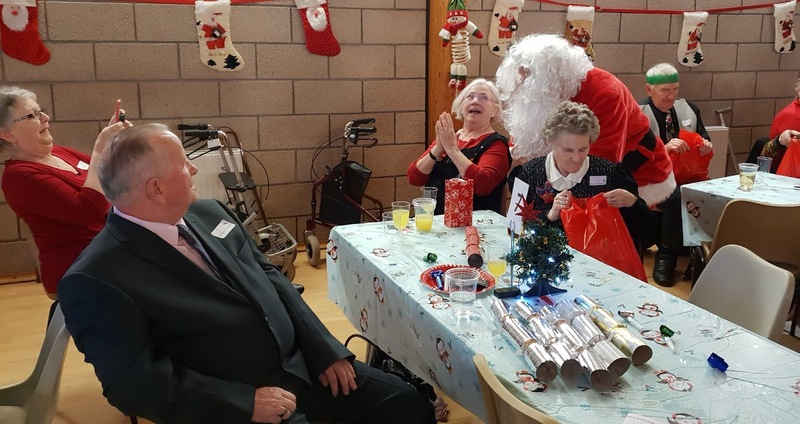 As is usual we open presents, have something to eat, just snack food they can pick at, then spend time playing with the younger ones games. 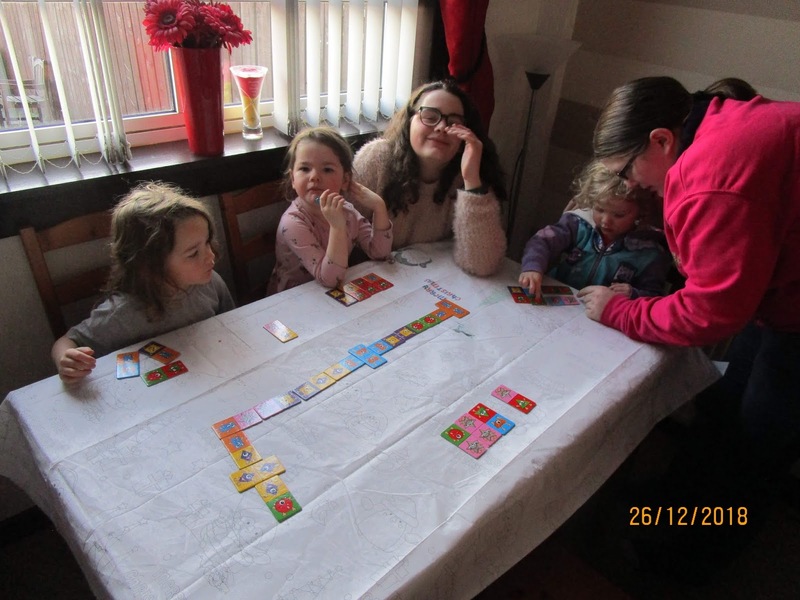 Then once the younger ones had been dropped back off we played games with the older children. You can read more detail on our fun packed days here. First decent walk I have had time for in way to long. So we went along to Failford and were out for over two hours. Bumped into a friend we have not seen in way to long and it was lovely to catch up with his life. I went today to buy some black bun as I really like the stuff. Hubby has Christmas cake that his sister made and her husband decorates every year. I only eat the marzipan and it seems such a waste. The cake looks amazing. It has taken me what seems forever to get the first picture cross stitched onto the baby blanket. 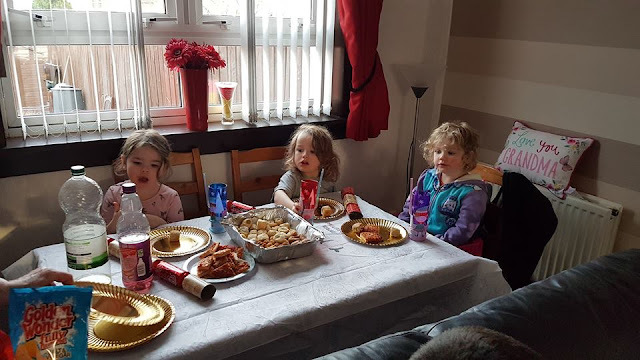 As we don't have young children any more the magic has gone from Christmas day for me with no excited faces to wake up to and so for a number of years have ignored the day as much as is possible. 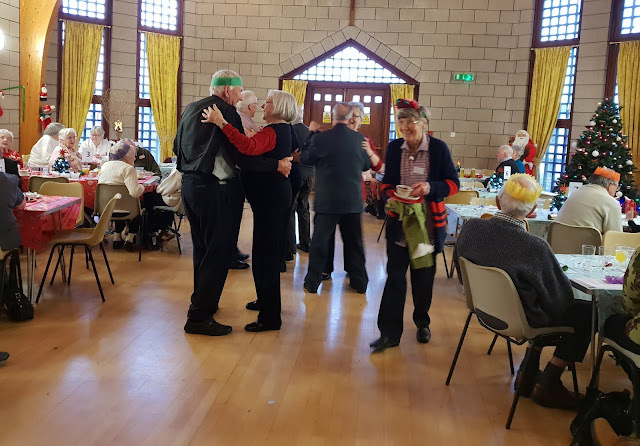 So having decided last year to go and help out on Christmas day at a local event providing a meal and entertainment for people who would other wise be alone on the day, we are now planning on doing this annually. Because we have the dog we did not want to be away for as long as last year and so instead of volunteering to pick up people and take them to the event and then take them home afterwards we decided this year just to go and do the event itself. 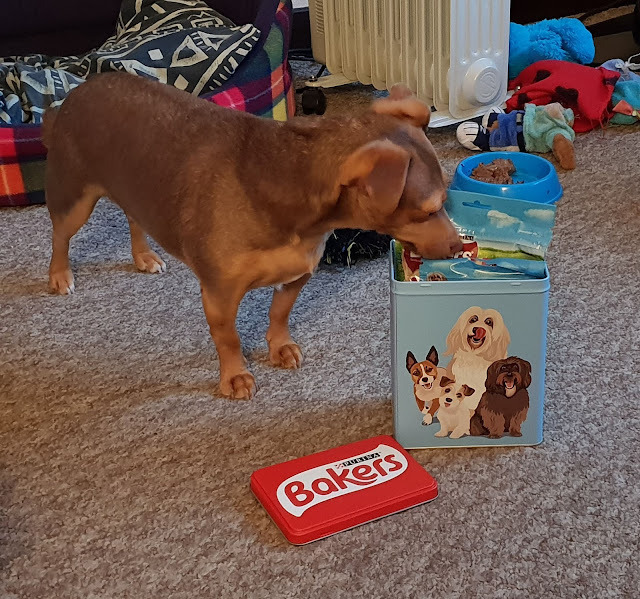 We opened our presents in the morning and Dixie dog got hers. This ball was from our neighbours which was lovely of them. So I helped to serve food and take photographs. Was nice to see familiar faces from last year. Felt the event was not as busy as last years had been and it seemed to go quicker and smoother. Have to laugh as hubby gets rather OCD about his sink and his dishes, and gets annoyed when other people go near or put things where he does not want them to be or do things in "the wrong way" it is quite comical. After the meal we had an entertainer. Personally did not think much of him but he did a better job than I could have done. 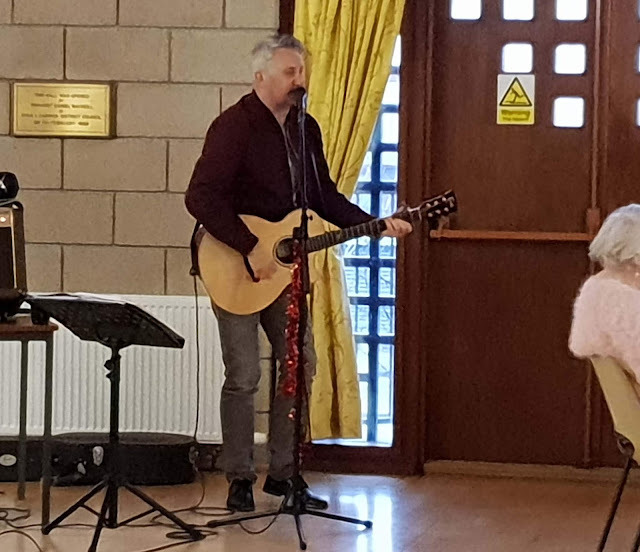 The entertainment was followed by Santa. 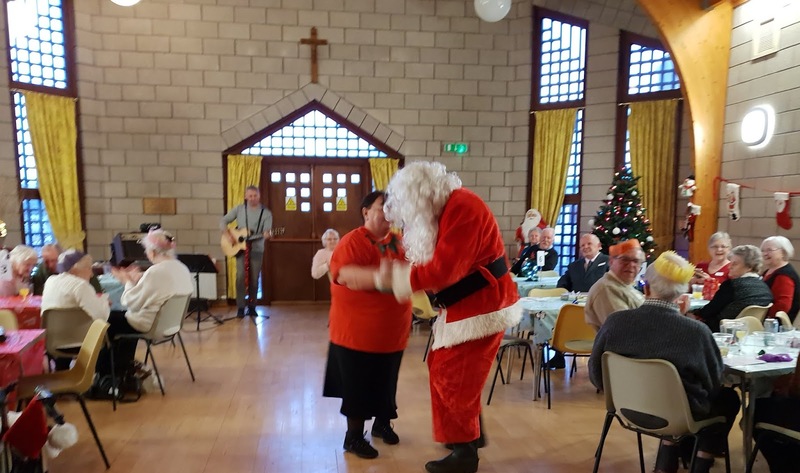 The CEO of VASA that runs the event has a dance with Santa before he starts working. His elves follow behind him carrying the bags. 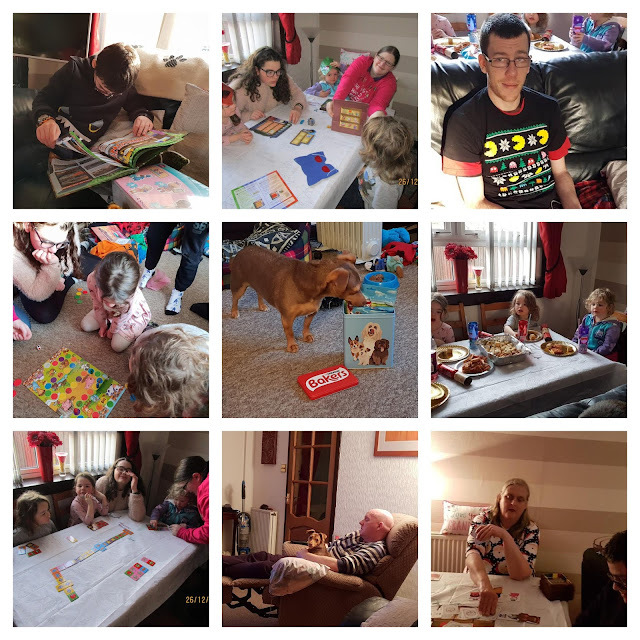 So on Boxing day we had our Christmas with the children. 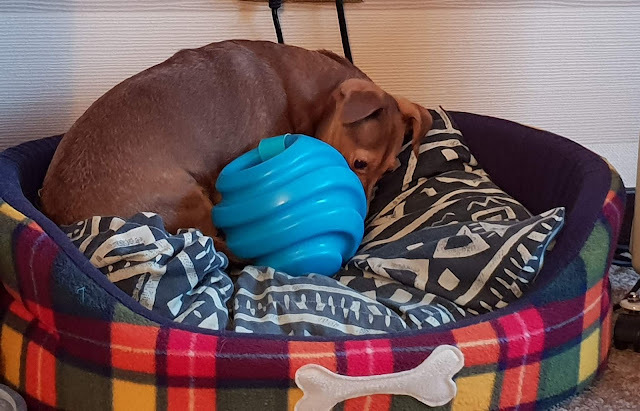 The dog is not keen on a room full of excited toddlers,and wants to chase them and play with them, but the two girls get a bit panicky so hubby took Dixie out for nearly three hours. 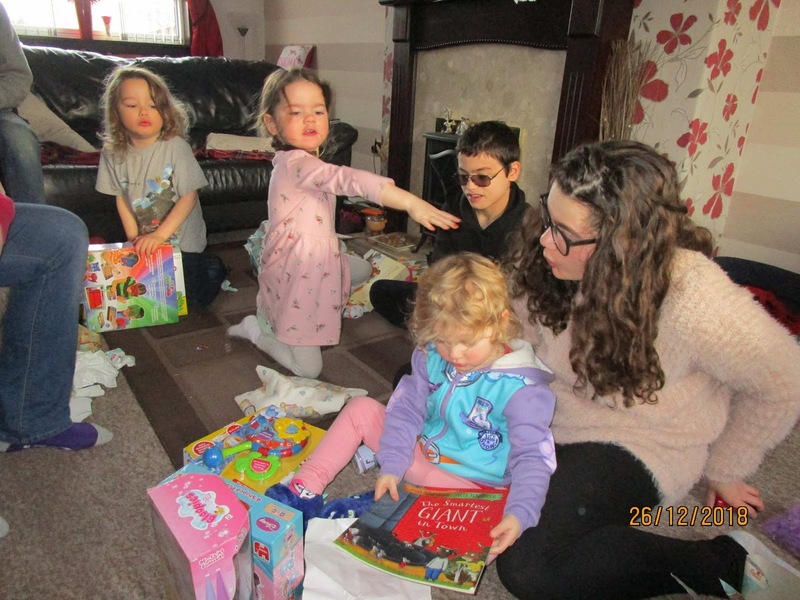 So first off they got to open their presents from us and DD2. Then Fifi got to open a big one from DD3. It is a suitcase so that she has one for when she goes off on camps instead of having to borrow one. 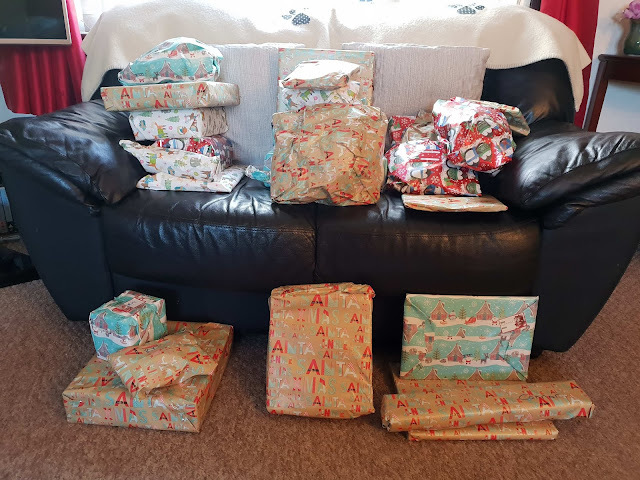 It was full of presents for them all. So they set to opening these as well. After present opening we had something to eat. 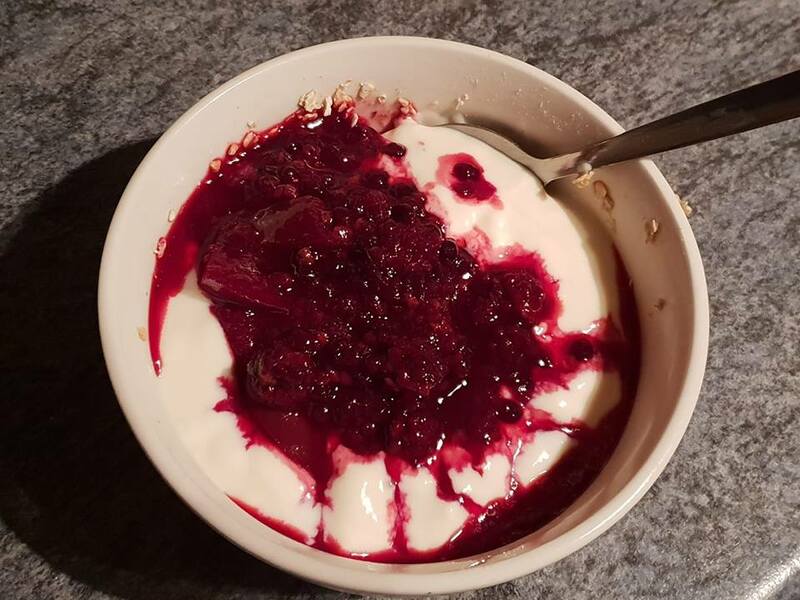 No point in making a proper knife and fork meal so we had snacks, easy to eat and none time consuming. SIL3 set up a Christmas music playlist. I really .liked his t-shirt, Christmas pacman. Then we sat and played games with the younger children. Spud manages with a bit of help and we pair up in need be so that everybody gets to play. Bob spent some time reading a book he had got. 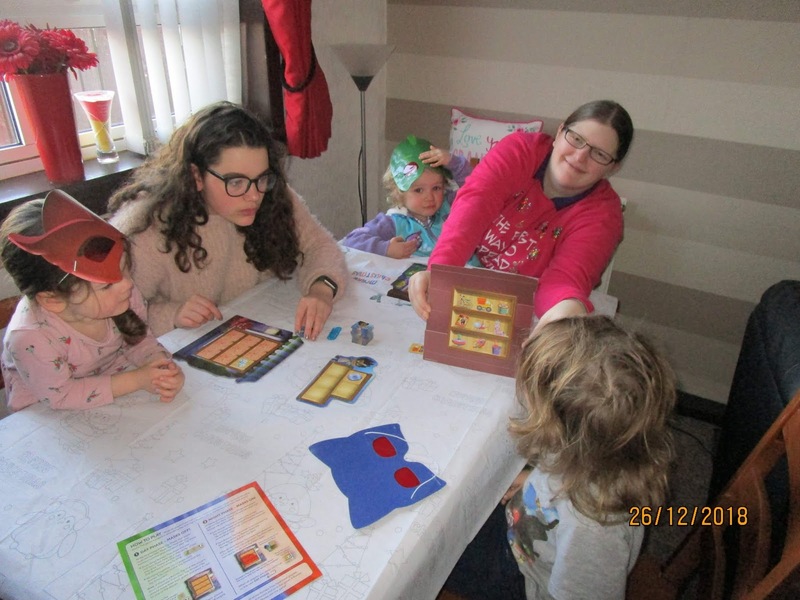 They got a PJ Mask game that required them to wear masks that enabled them to see pictures on the cards when they had the mask on but not when they took it off. 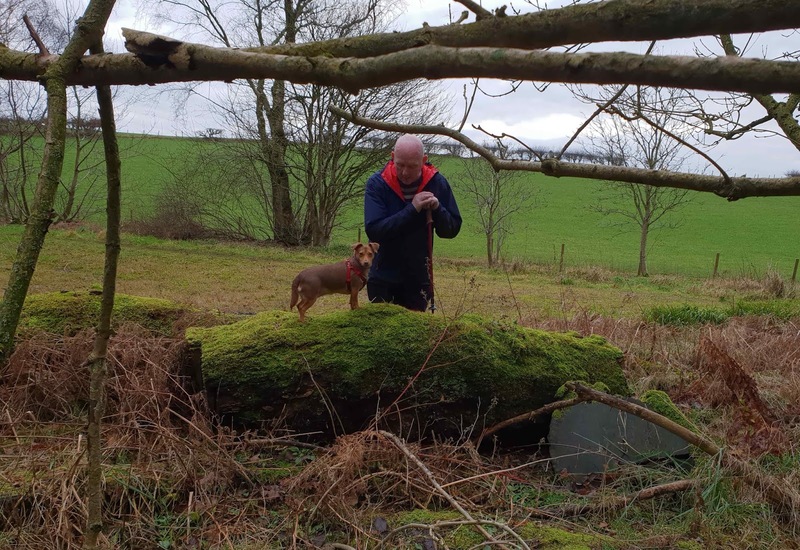 By now Dinky was beginning to flag as she was not feeling overly well. 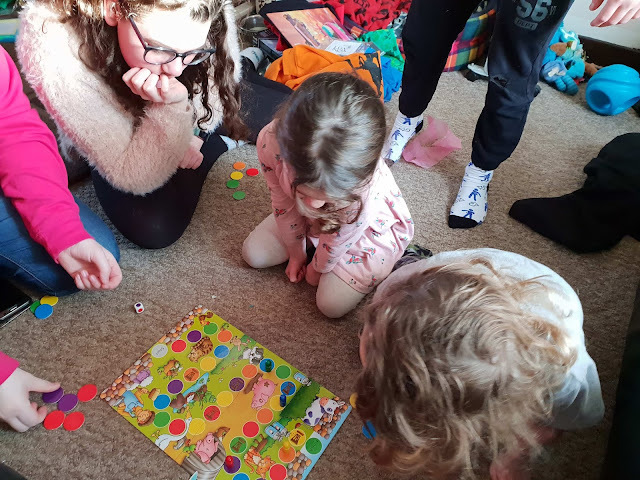 So we packed up all the toys and clothes and took them with us down to their house and went back up the road with the older two to play big people's games. 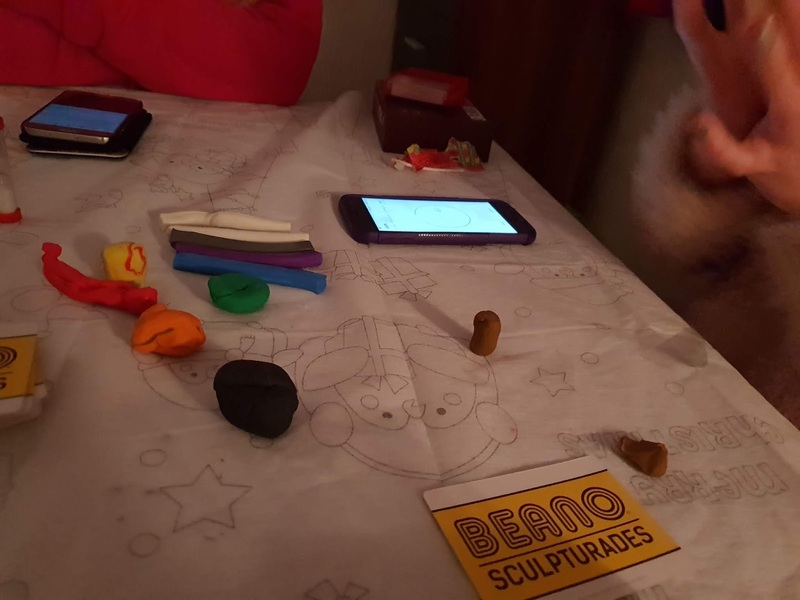 Once they had gone back down the road - just after 3pm we then change over and play bigger peoples games.Two seasonal favourites - exploding kittens and bears vs babies followed by two new ones this year - Beano The Sculpturades game, this was a new game, basically charades in Plasticine but a lot of fun. We cheated and did every second round as a proper charade. 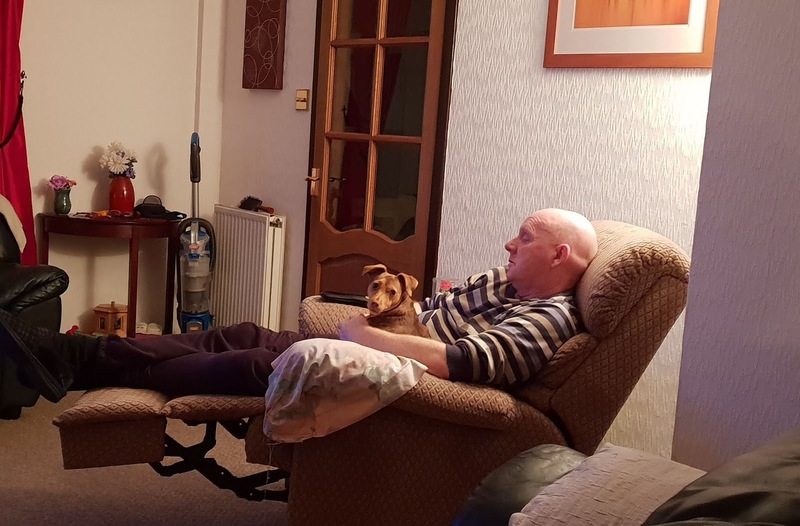 Hubby does not do playing games so him and the dog watched tv. They went down the road just after seven as I think they had had enough by then and Bob wanted to watch a tv programme. I hope you all had a good a time as we did. There are all sorts of problems that motorists face in and around Basingstoke which impact on their cars' tyres. First of all, the number of potholes and raised ironworks you see on the road seems to go up every month. Running over these causes damage to the rubber in your tyres and can lead to premature ageing. Then, there are the many speed bumps that you see around the town. Basingstoke certainly seems to have more than its fair share! These, too, knock air out of your tyres leaving them deflated. Of course, the occasional broken glass in the town centre can also cause damage to tyres if you fail to spot shards on the road ahead of you. What should you do to avoid problems with your tyres and what can you refrain from doing to keep them lasting as long as possible? Firstly, you should keep your tyres properly inflated. If the rigours your tyres go through driving around Basingstoke are anything like average, then keeping them pumped up will be beneficial. This is because partially deflated tyres from bumps in the road wear down quicker because more of the rubber spreads out onto the tarmac, thererby offering greater levels of friction. Secondly, you should inspect your tyres for any side bulges that appear. This can occur for a number of reasons, including exposure to lots of direct sunlight, often a problem if you park on the street. Sidewall bulges mean that your tyre is about to blowout and you should exchange any that have them. Get your tyres in the Basingstoke area now from Point S where you can reserve the ones you want online before turning up, saving you time. Something you should avoid doing is driving too close to the car in front. Even in the slow moving traffic you get making your way into Basingstoke's town centre, leave a gap so you can see the road ahead. Without so doing, you are more liable to drive over things that will damage your tyres, such as nails and sharp twigs. Finally, avoid braking with excessive force. Instead, use your brake gently and progressively. If you adjust your driving style in this way, then the tread on your tyres will last much longer. It is a good tip no matter where you live but especially in southern England where there is so much traffic. Sorry I am not a Christmas lover for various reasons, so for me "It is beginning to look a lot like Christmas....and a bah humbug to you and yours". I know this sounds terrible of me but I cannot help how I feel. 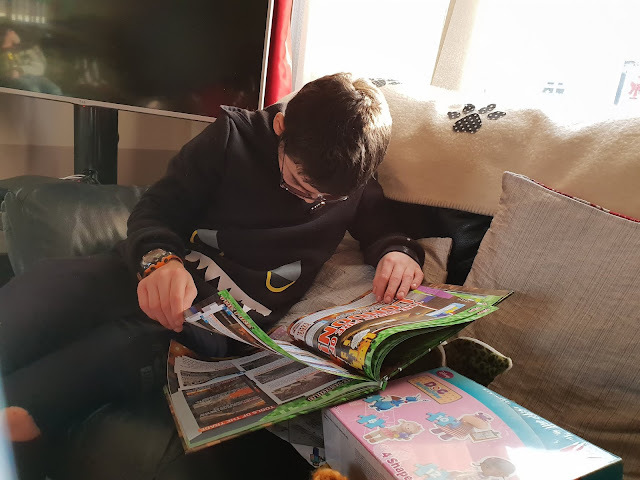 I often feel this time of year can be stressful especially when you have children who get hyped up by the school, their friends, the adverts on television, just to mention a few stimulus. This is not just direct finances of buying to send to Santa but school parties/discos/panto trips all add significantly to feeling stressed. 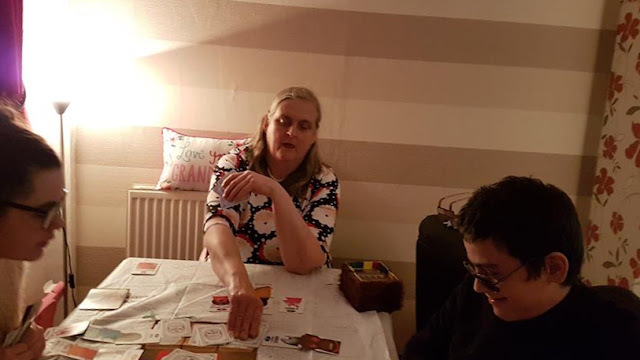 Some expenses can be lessened, I buy my Christmas cards in January every year and I managed to get a box of twenty for five pence, definitely the right time to buy them especially if you have children at school that want to give one to everybody in their class. I know what it is like to feel it is all too much to afford but it does not have to be, your child, especially the under eights will not realise there is no cellophane wrapping on the game you bought from the charity shop, after all the elves do need to check a certain amount for quality control purposes! They will have just as much fun playing with it. How many of you buy your child a brand new outfit for Christmas Day and it is worn once or twice? This fills the charity shops with amazing quality nearly new clothes the following year that you can buy for your child, much less of a worry if they spill something down it at the school disco when it has cost you ten percent or so of the price of new. 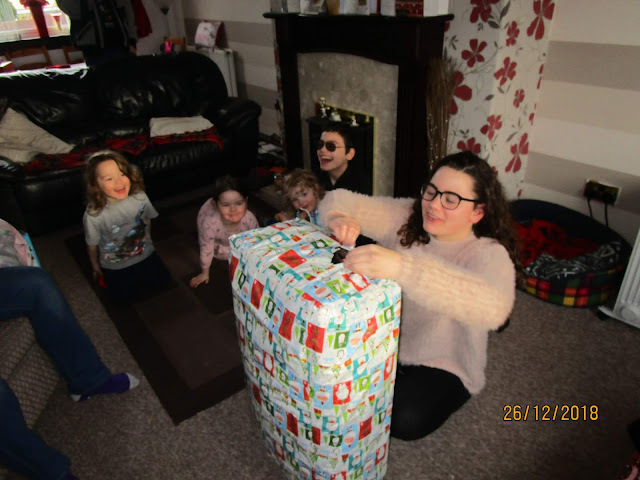 It also gets to the point where the magic has gone out of believing for your children and ours were more than happy to just have a few small things to open on Christmas Day and then we would go shopping with their allotted budget in the post Christmas sales getting them much better value for money. But I feel the pressure is less now as a grandparent which lets me enjoy the season more than I use to do. 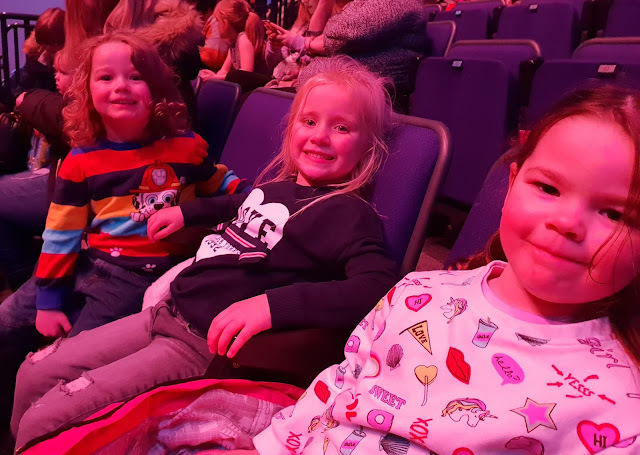 On Sunday I took the older two to the pantomime as part of their Christmas. I much prefer to give them experiences than physical presents, they get plenty of them at home. I like to add to my feel good factor at this time of the year and I always organise a collection for a local food bank. This helps out some of the people seriously feeling the pinch at this time of year. Have been close to it myself in the past. 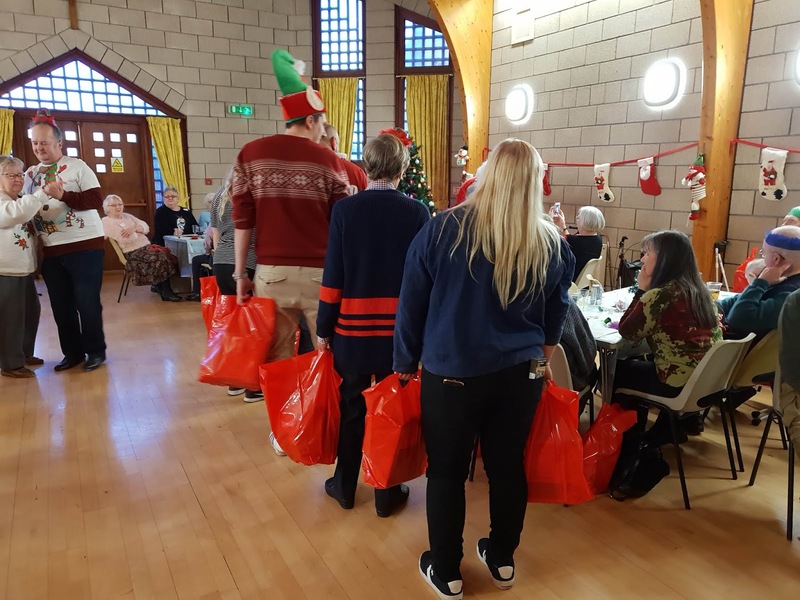 So on Wednesday I dropped off over £200 worth of items generously donated by some local people as well as a collection round a retirement complex that I do holiday relief cleaning in. 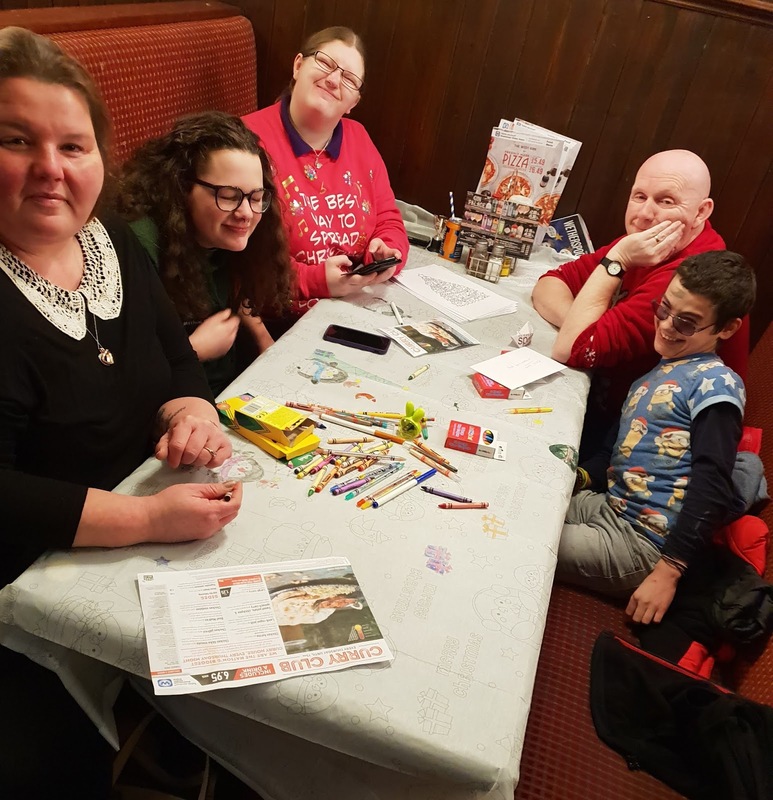 More being jolly and joining in with the spirit of the season, on Thursday there were six of us met up for what has become an annual family and friends Christmas colouring competition. This started off quite by accident about six years ago and despite the fact the eldest granddaughter is now sixteen she still loves to come and have a mad time for a few hours. I think it is a lovely thing to look forward to. Next year we will need to find somewhere different as we will need bigger tables as the younger ones will be old enough to join in and my SIL is jealous and she wants to come next year. hubby's picture, top RHS won this year. 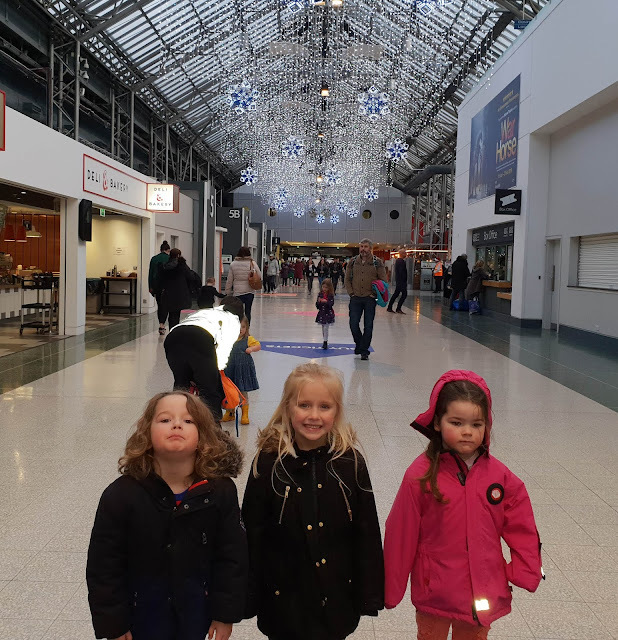 On Friday I took the gruesome twosome along with one of their friends to see a live show in Glasgow as part of their Christmas, a very nice competition win has made this possible.I won four tickets shame to waste the fourth one and Spud is just too young yet to go. It started with one penguin, went to two, then ten, then dozens. It was well done and a lot of fun. 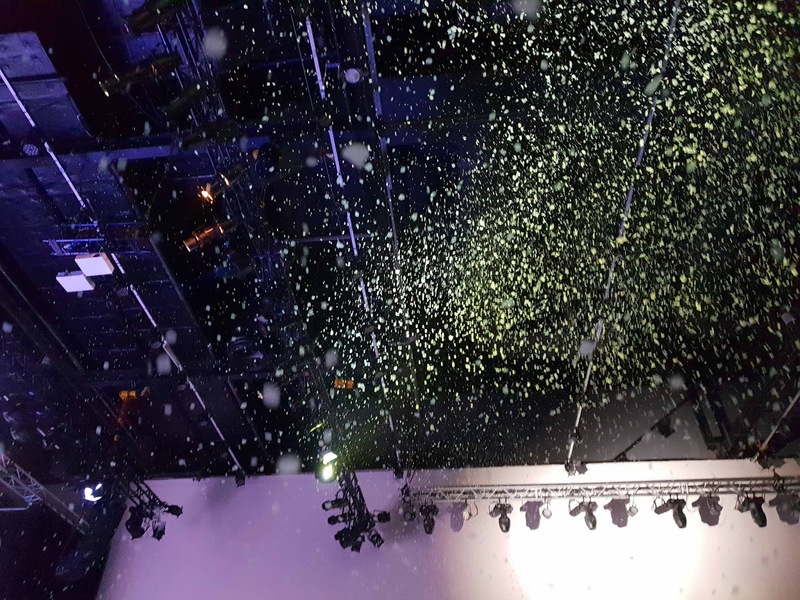 We were sat under the snow machine when it snowed....this produced a lot of hilarity and some of the children from other areas of the theatre came to get snowed on. 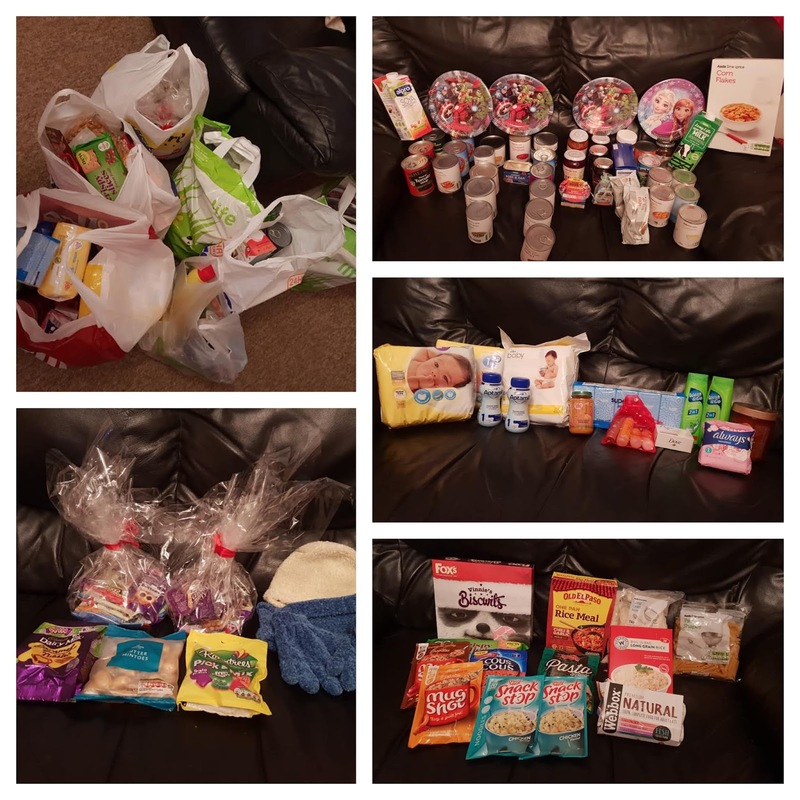 If you are planning on doing things like this it is a great way to budget for the expenses as tickets can be bought in advance and then you just need money for the actual day and like a lot of people we took our own snacks and juice. My panto tickets were paid for back in August. I got a good price on them as I bought them through my Unison membership. I also save through my work credit union, the money comes off my wages and I don't even miss it and it help out not only with Christmas but if anything goes wrong with the car or other unexpected bills. .
A lot of people can run out of money at this time of the year. it is very easy to do, and then for a lot of us that get paid early you have six weeks until pay day at the end of January. If you find yourself a bit short there are companies like CashLady.com that can help out. Christmas loses the last of its sparkle when there is just the two of you left to stare at each others ugly mugs on the big day.I do not see the point of doing a big dinner for two of us, to start with it can be an expensive thing to do and I cannot justify spending a large amount of money on one days meal so we have not bothered doing much the last few years. We took the decision last year to help make a difference to those less well off than us. Some people have no company at Christmas and will spend the day alone, but there are many agencies that provide a meal and a nice party afternoon complete with a present off of Santa and all for free. We had a great time, well I did anyway, hubby spent all day washing dishes, going along to a local one last year as volunteers. We also get given a free Christmas dinner with a doggy bag to bring home. a win win all round. You can read about our great day last year here. So there you have it....my attempts to enjoy the season by bringing pleasure to other people. How do you get round your feeling of bah humbug? This is a collaborative post but the thoughts, feeling and events are all true. On Sunday I took the older two to the pantomime, and I think it is lovely that at 16 Fifi still wants to come. This is part of their Christmas every year and to me I prefer to pay for memories and experiences than presents. 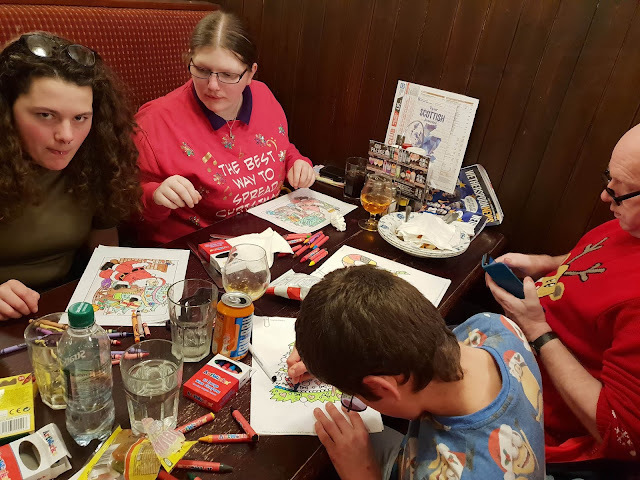 On Thursday we went and had our daft laugh a minute annual family and friends Christmas colouring competition where we go usual to our local 'Spoons and we have a meal and a drink and sit and colour in Christmas pictures. Again it is the older grandchildren that encourage this because they love it so much. 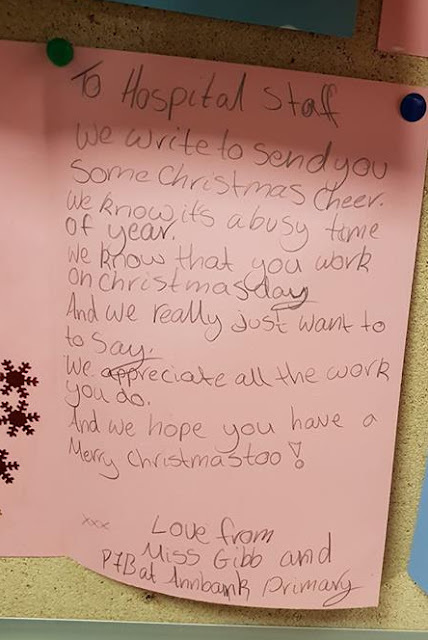 I think it is so lovely they still want to do this. 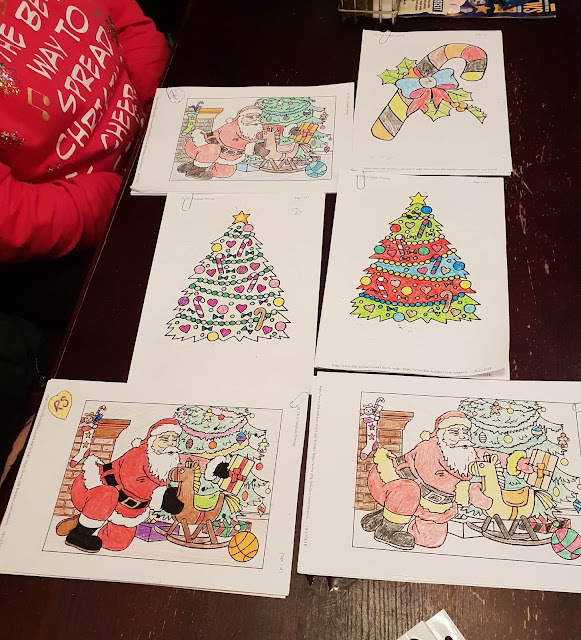 The candy cane top right won, We got the duty manager to choose the winner. On Friday as I had won four tickets I took the twins and one of their friends ( in the middle) to a show in Glasgow, Mr Poppers penguins. The show was amazing, the children were in fits of laughter throughout not to mention when we got "snowed on" on our way to Antarctica and they really enjoyed dancing like penguins at the end. We also stopped in at McD's as it is a place they never go due to their big brothers food allergy issues and they hear their friends talk about it. Dinky went on more about McD's than she did the show. I had forgot to pick up their juice so stopped at a petrol station and picked up three cans. and decided to give them those in McD's and kept their fruit shoots for the show. 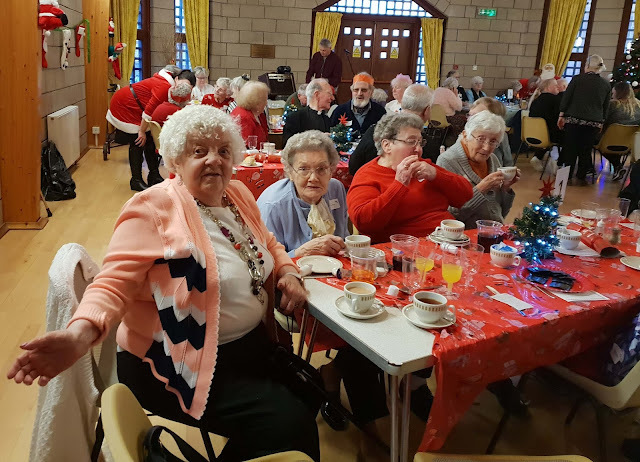 So lots of fun has been had in the build up to Christmas. Hope you all have a great time what ever you are doing for the big day. 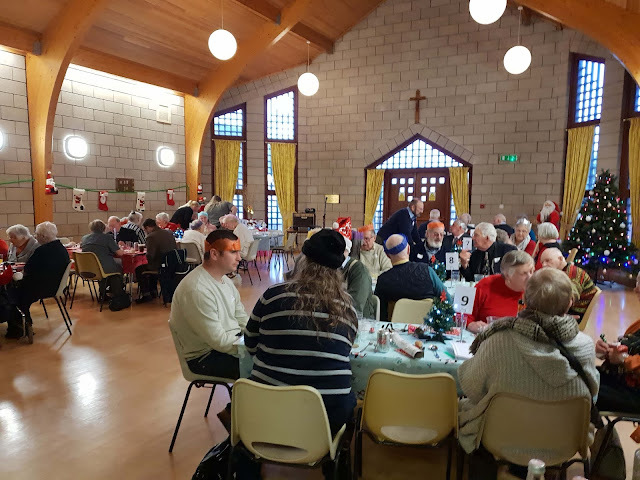 We are off to volunteer again on the big day this year to a local church hall to help serve a five course meal and drinks to members of the community who would be home alone for Christmas other wise and it is all for free. Was great fun last year with games and dancing and a visit from Santa. Well nearly another year done. 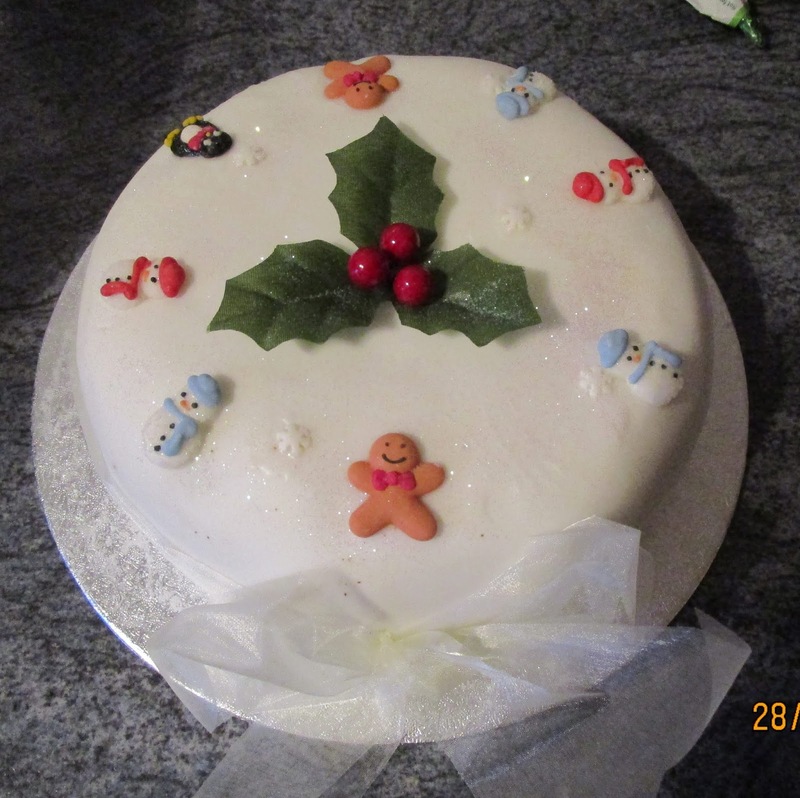 Considering I toyed with giving up on my blog this time last year then I have done all right. Been a busy old week with one thing and another. Don't seem to have had five minutes to myself. 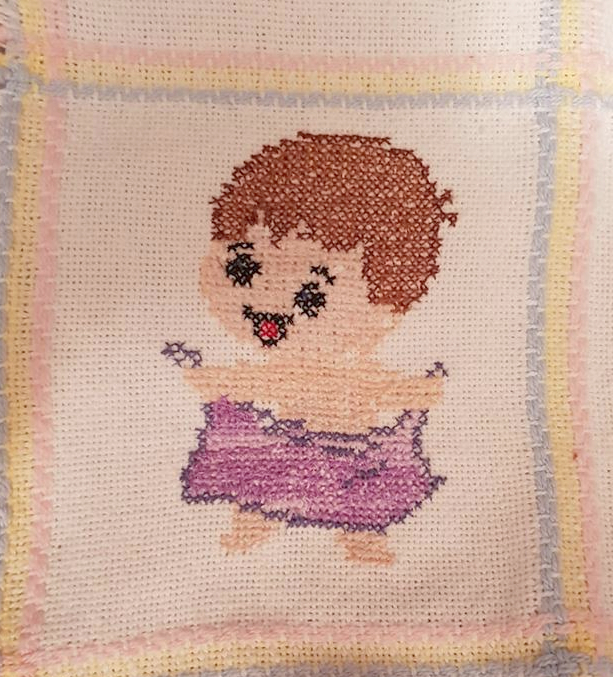 This week has been going back to the title of my blog.....having fun as a gran as you will see. I would rather give the grandchildren experiences rather than physical presents. We all get so much more out of it than something they might put in a cupboard in their room and never use. So today Fifi, Bob and I went to the pantomime. We saw Aladdin at the Gaiety in Ayr. Have to say one of the best pantos I have seen in a few years. A lot of audience participation, lots of bits of adlibing and cast members to busy laughing to carry on. 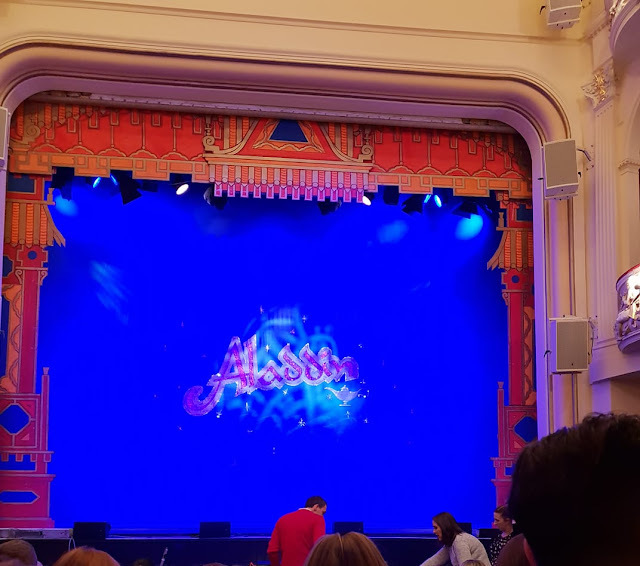 As is usual no photos allowed of panto so this was before it started. Hubby has a very daft sense of humour at times. DD2 takes after me and cannot stand a clock ticking especially at night. So whenever she comes down she either sticks the clock under a pile of clothes in a drawer or takes the batter out. So hubby wrote a poem to the demise of the clock and hung this on the wall where the clock use to be. Spotted a single bed frame for sale locally so went and picked it up this evening. We got a brand new mattress a few weeks back so now have a single bed for the back bedroom. Just need to buy a bed guard for it now. 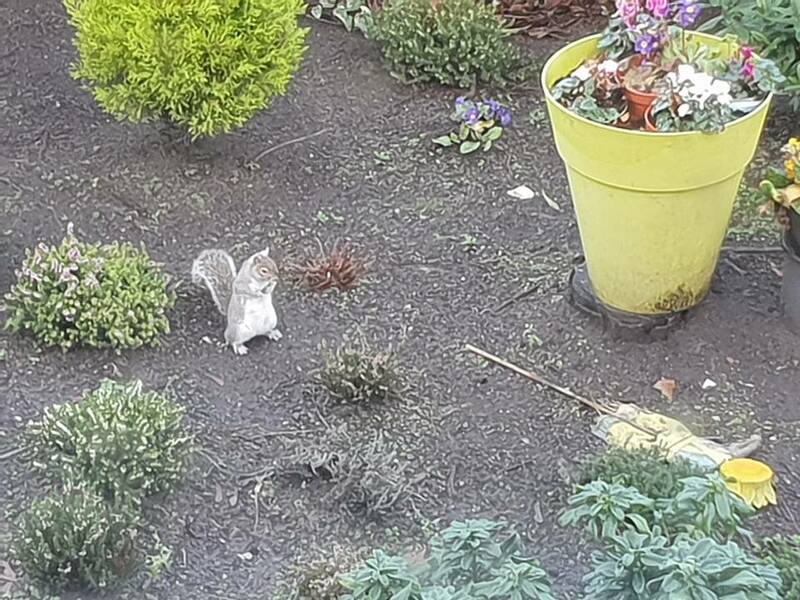 Spotted this little squirrel out in the garden when visiting a friend. This picture was taken from upstairs so not the bet angle. 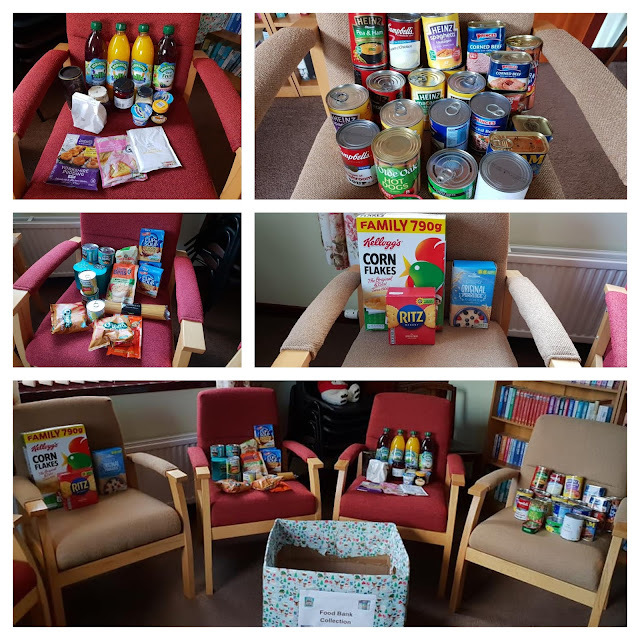 I have been collecting for a local food bank for two weeks and between local people in the village and the elderly residents in a complex I do holiday relief cleaning in I handed in over £200 worth or food and toiletries. A great success in my book. This was the local contributions. We went and did some food shopping after tea tonight as was running out of certain things and knew it would not get done till Monday if not, and I AM NOT going shopping on Christmas Eve for my normal monthly shop. A full on day for me. I was invited to past one of a bike maintenance course. I need to do this and a few other courses do be allowed to lead bike rides. We are hoping to get bikes in the village and do volunteer led bike rides round a few suitable routes round the village. These courses will also double up to allow me to do bike leader with The Active Travel hub as well. Will also allow me to go into the school and help with bike ability. Finished the course and then home to get changed, pick Bob up and into the town to pick up Fifi and meet up with Auntie H and our friend Sam for our annual family and friends colouring competition. 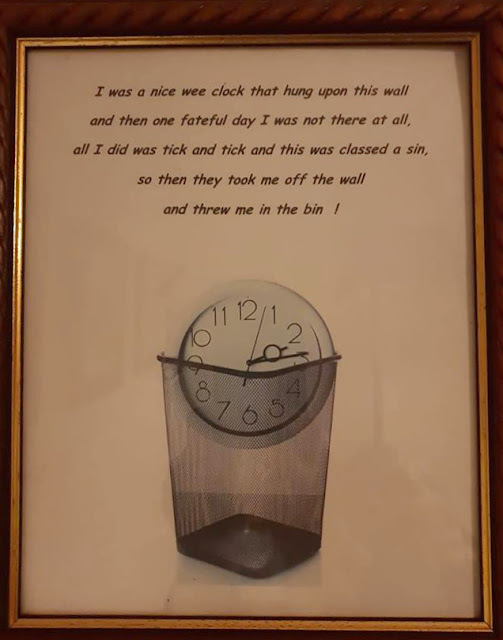 Held this in our local 'Spoons and got the duty manager to pick the winner. This year it was hubby's turn to win so the cup was passed from Auntie H and is our responsibility to look after (and dust it) for the next year. 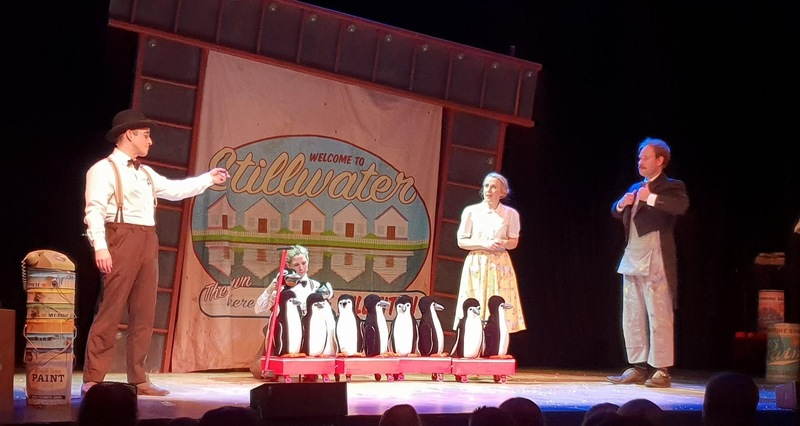 I was lucky enough to win 4 tickets to see Mr Poppers Penguins at the SEC in Glasgow. So I decided this would be great to take the twins to see. I just feel a panto is to long for them for another year or two. The also go with the school to a shortened version. Spud is not quite three yet and so still to young for this sort of thing. So I took one of the twins friends with me, I had room in the car so decided it was better than wasting the ticket. I decided to make more of a treat of it and took them to McD's as well. They never get to go there as Bob cannot eat there. Minky has gone on about the show, Dinky's best bit was McD's. We had great seats and they three of them really enjoyed their day out. 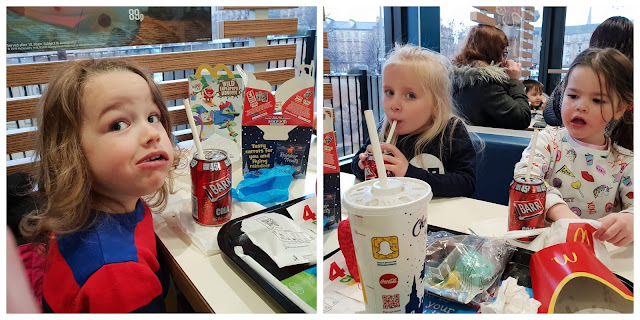 I did notice that McD's have changed to paper straws ( as had 'Spoons) but do other people not find that a) they go soggy to quickly and b) the fizzy juice bubbles back up them. Have promised Spud a trip to McD's followed by park as she howled because I did not take her today with me. This is the last of my foraged fruits out of the freezer. Going to have to go back to buying fruit now. Took up a lot of freezer space at the time but well worth every penny. Labels: Aladdin, pantomime, Project 365, SEC Glasgow. My Sunday Photo 16th Dec.